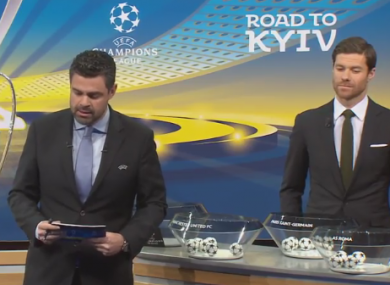 Pedro Pinto and Xabi Alonso during the draw. THE DRAW FOR the last 16 of the Champions League has taken place this morning. Real Madrid, who have won the competition three out of the last four years, have been paired with French heavyweights Paris Saint-Germain — pitting Cristiano Ronaldo against the world’s most expensive player Neymar. Five Premier League clubs made it to the knockout stages this season and they have had mixed fortunes. A favourable draw for Liverpool sees them face Porto, while Manchester United meet Sevilla and Man City take on FC Basel. However, it looks more difficult for the London clubs as Spurs are up against last year’s finalists Juventus and Chelsea clash with Barcelona. First legs will be played on 13/14 and 20/21 February, with the return ties on 6/7 and 13/14 March. Email “Holders Real Madrid drawn with PSG in the Champions League last 16”. Feedback on “Holders Real Madrid drawn with PSG in the Champions League last 16”.